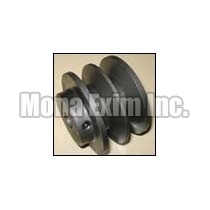 From Mumbai (Maharashtra), we are regarded as the credible Manufacturer, Supplier and Exporter of the top-tier Pulley Groove in the global markets. Falling in line with the established industry standards, these Pulley Grooves are acclaimed for their precise construction, fail-safe functionality and durable life. We make them available in the configurations as demanded by our clients. For the reasonable pricing and timely delivery, stay assured!